news The full Federal Court has largely reversed an earlier decision by a single judge which had found that TPG’s advertisements of its $29.99 ‘unlimited’ ADSL and telephone bundles had been misleading, forcing the Australian Competition and Consumer Commission onto the back foot in the case. 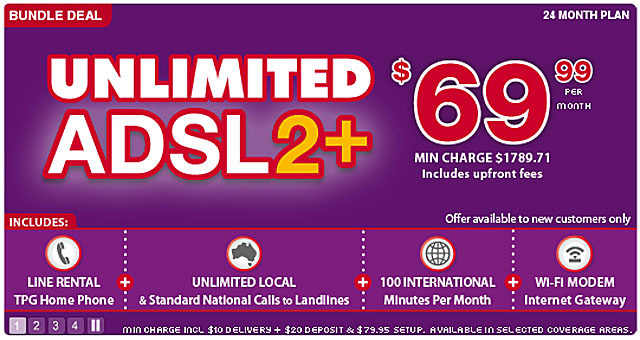 The long-running case was first filed by the Australian Competition and Consumer Commission (ACCC) in December 2010, with the regulator claiming TPG’s $29.95 ‘Unlimited’ ADSL2+ plan actually cost a great deal more. TPG subsequently dumped the plan, replacing it with a $69.99 offering. In November 2011, Justice Bernard Murphy found advertisements for the plan misleading and eventually settled on a $2 million fine allocated to TPG in the case. However, late last year, the full Federal Court allowed TPG’s appeal in the case, ruling that Justice Murphy erred in applying the legal test of whether the advertisements misrepresented the offer and also erred by not giving appropriate consideration of consumers’ knowledge relating to bundling practices and set up charges. The court did uphold Murphy’s decision relating to TPG’s first initial TV advertisments of the plan, and did uphold some findings regarding website and newspaper advertisements. That section of the Trade Practices Act relates to the way pricing is advertised. However, in the full judgement in late December, available online here, the Federal Court made it clear that revised TPG television, and initial and revised radio, print, public transport and online advertisements published by TPG of the $29.99 plans were not misleading. In a statement, the ACCC said it was currently reviewing the Judges’ reasons in the case. “The ACCC will continue to take enforcement action to improve clarity in advertising in the telecommunications industry as a priority,” the regulator stated. The judgement is likely to mean that TPG will be required to pay a substantially smaller fine, as $1.4 million of the initial $2 million fine related to revised advertisements — which the court found were not misleading. ” … it’s not often your humble writer sides with TPG. We delivered the company a bit of a rebuke when it bought PIPE Networks, we’ve been known to opine about the strength of its customer service in the past, and we typically tend to recommend either iiNet or Internode to others when they ask us which ISP they should source their broadband from. However, in this case, it has to be said that it looks like TPG is on solid ground defending the ACCC’s lawsuit. Over the past week, we’ve been keeping an eye out for the company’s advertisements in a variety of media. Cinema ads, internet ads, print ads, ads on the sides of buses. And one thing seems clear: All of the TPG ‘Unlimited’ ads we’ve seen have displayed the extra costs pretty prominently. Sure, they’re not in a huge font size, but they’re there. It looks like TPG is right in this case: It doesn’t appear to have done anything wrong. Let’s hope the ACCC will be a little more careful with its lawsuits in future. And we do wonder whether this victory (we doubt the ACCC will appeal this to the High Court) will see the return of TPG’s $29.99 plans. Good. Now lets move on and starting going after the real problems while the stupid mobile cap plans, other excess charges and the seemingly endless credit telco’s are willing to bankroll. and again we point out that tpg NEVER dumped the ‘$29.99’ plan. then they ‘added’ the included call (for $10) to the bundle as an EXTRA deal. The advert was NEVER misleading and im glad the judge used some common sense. The ACCC will have alot of explaining to do. I joined Tpg during that time and understood exactly what i was paying for. Like they say read the fine print. Then all the posts in this forum and coalition media statements to the effect that TPG’s $29.99 internet plan (which in reality mandatted a $30 phone service whether used or not) meant that NBN data only services would be unable to compete price wise were deliberate falsehoods and driven wholly and solely by political motivations? I remember people time and again pointing out the phone charge to people making the claim to no avail. Disclosure: TPG user since 1998. In spite of the fact I’m having a minor dispute with TPG currently their offer seemed crystal clear to me. The offer always had caveats but seemed to be well articulated. ACCC must need wins so badly after their apalling track record. Another loss for them. Thanks ACCC from this taxpayer. The ACCC have clearly nothing to do. With everything you sign or read the fine print must always be read. In this case even the ACCC didnt even read the fine print. I did and understood 100% that it was $59.95 that i would pay. Even when i rang to connect i was told that over the phone. Another waste of tax payers money. I think most people (including Renai) are talking about the ‘revised’ advertisements in their defense of TPG… the hastily revised versions (i.e. the ones just adding more fine print – prior to being replaced with the bundle advertisements) are not what drew attention, they just got thrown into the case also for good measure. I am fairly certain (because I remember it, but I can’t be 100%) that when TPG *first* started advertising their $29.99 unlimited plan, not all of their advertisements actually noted anything about needing to bundle. (Radio, I think, definitely didn’t; quite likely TV didn’t either.) The fact that they revised the advertisements, prior to any action even being taken, kind of says it all does it not? Even TPG’s own legal people, who for some reason thought it appropriate to approve the ads initially, freaked out at the slightest whiff of ACCC attention because they knew the ads could only be found illegal. That’s why they were revised in the first place… ACCC still weren’t too happy with the revised versions, obviously the court is OK with them, but that’s got nothing to do with the initial ads that got attention. although ‘small’ in a banner it IS clearly there. I’m still waiting for a case of offended user who was ‘suckered’ with this plan or were the accc just going after tpg for kicks???? An investor briefing is not an advertisement. You can wait as long as you like – evidence of a person actually being mislead is not a prerequisite of an action for a Misleading or Deceptive Conduct breach of the ACL. TPG were never going to lose this.